We have put together a general price list for some of our most common types of vehicles and items that we polish, these are general to give you ( the customer ) and idea of some of the cost. we hope this helps. we do appreciate your comments. 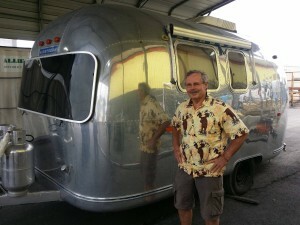 For an exact quote please call, text or e-mail us with some pictures of your inquiry and we will respond ASAP. Our contact information can be found on our contact page. 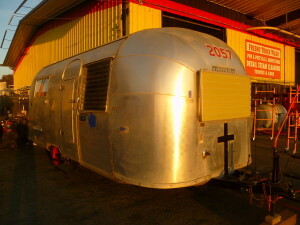 If your airstream looks like this or similar , never having been polished and still having the clear coast on it still prices range from $165.00 to $195.00 per linear feet Depending on a couple of factors , like is there clear coat , is there some pitting in the aluminum from sand blast like debris or small holes from the impact of tiny rocks, is it heavily oxidize. note: we measure linear feet, ( from back bumper to from trailer hitch ) FYI we measure like this because we don’t measure and add the front and back of the trailer. If your airstream look something similar to this, and maybe your have had it polished before like once a year the price would be about $125-165.00 per foot. 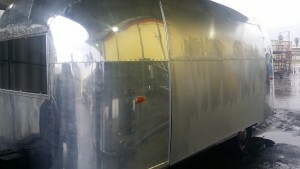 If your airstream look something similar to this, and maybe your have had it polished before like once every 6 months, the price would be about $95.00-$120.00 per foot this trailer will not have much oxidation, and will not have and heavy scratched. The customer benefits from an affordable price because the trailer has been well maintain.